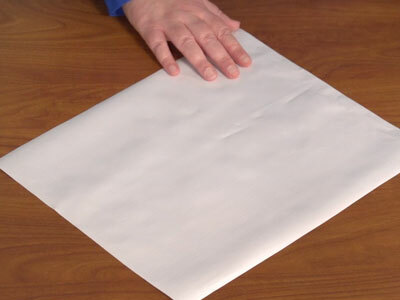 Waterproof oilcloth fabric is a fabulous choice when making purses and bags, upholstery, jackets, aprons, and anything else that you'd like to remain resistant to water. 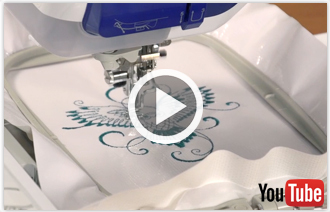 Learn our best hints for embroidering on this type of fabric! 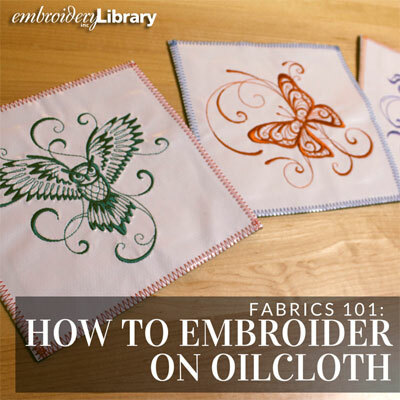 Oilcloth fabric is similar to vinyl, and this technique can be used for embroidering on that fabric as well. 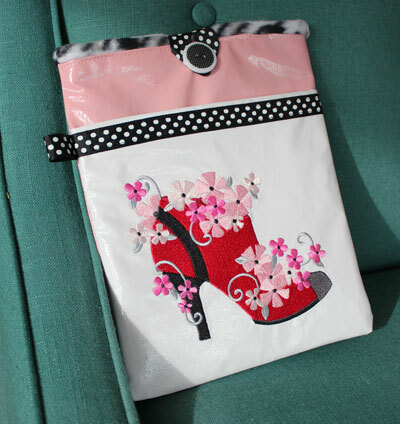 There are a few different kinds of oilcloth and vinyl commonly found in fabric stores. Choose the kind that has a knit or fuzzy back, as that helps to keep the oilcloth from tearing with the needle perforations. Oilcloth is surprisingly stretchy, so choose designs that are light to medium complexity, with open areas. 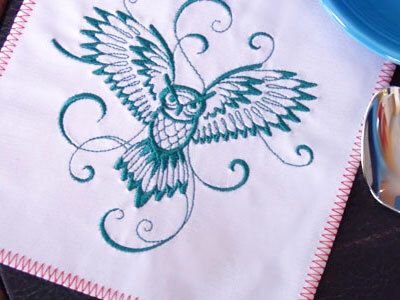 This owl design is a good example of what will work well on oilcloth. Designs that are too complex, or "blocky," will cause a subtle warping of the fabric. Use a medium-weight (2.5 ounce) cutaway stabilizer. 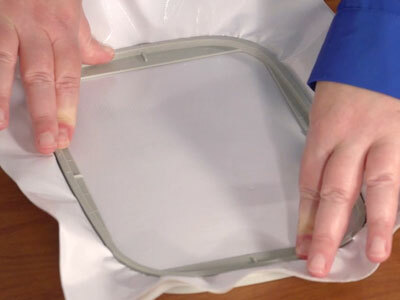 Hoop the oilcloth and stabilizer together. 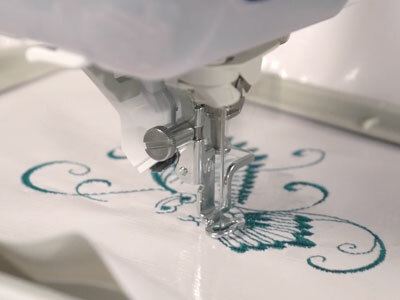 When embroidering on oilcloth, use a size 11 or 75/11 sharp sewing needle, rather than an embroidery needle. 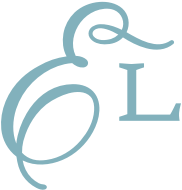 A sewing needle has a smaller, finer point than an embroidery needle, and it will make smaller, finer perforations in the oilcloth. 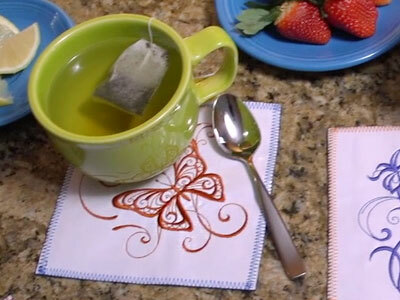 Here oilcloth has been used to make waterproof drink coasters. Find the instructions and design information for these coasters right here. 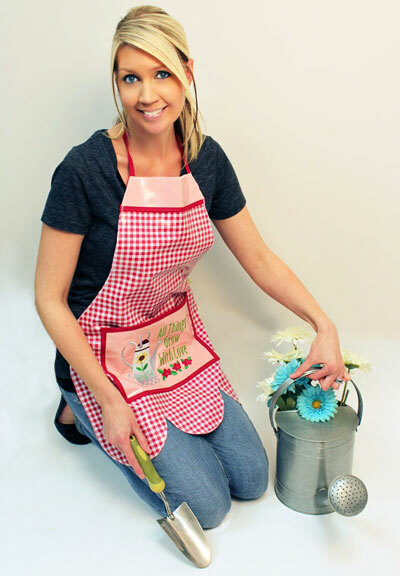 Using oilcloth on aprons makes them easy to clean up in a flash! Find the free tutorial and designs for this oilcloth apron here. 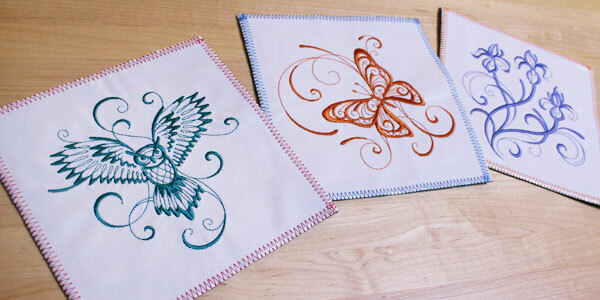 Protect your iPad, Kindle, Nook, or any other tablet with an embroidered oilcloth cover. Click here to get the instructions and design information for this cover. Design Choice Choose designs that have open areas, and are low to medium complexity; avoid complex designs, and designs that are "blocky" or filled in.